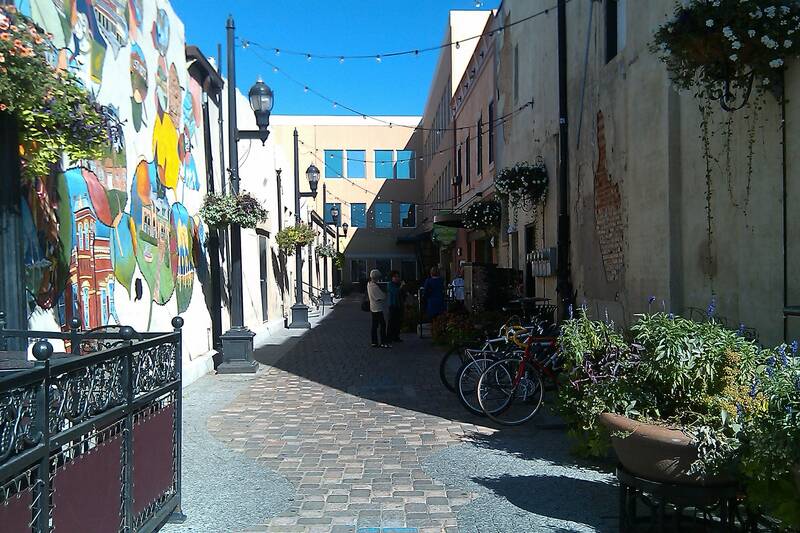 An alleyway in Fort Collins, Colo., where the downtown is bustling with local, independent restaurants, bars and shops. I like the discussion spurred by my last post; I think it’s an important one. Roger raises a good point: The city has gotten into the habit of getting a few steps ahead of itself on downtown development. Some developer comes up with an idea for a portion of downtown (regardless what business is currently operating there) and then the city sends out an RFP “searching” for a developer to do what the developer intends to do, awards them the gig, and then sets about razing buildings. Remember the Taste of China, anyone? Where is it now? In a storage warehouse. Yes, the owner was paid handsomely for his property, because he didn’t want to give it up for any price. It was more than a job; many of his relatives worked there, too. Talk to city officials about it, and they act like the owner was just greedy. No, he wanted to save his business. He lost. Remember Wasabi? It was trucked down the street and melded into Phreddy’s Phillies. The owner of that business is not happy with the way he was treated by the city, either. He lost. Douglas Theatre, the owner of the discount theater, was different: They wanted to shut ‘er down, and got paid well for both the $2 theater and vacant theater at 13th and P streets. whose owners were apparently so unhappy about it that they documented the dispute on their menus. They closed a few years ago. And now, the city is on the move again, displacing a chain of downtown businesses — Chipotle, Valentino’s, Quizno’s and Coldstone Creamery are being asked to kindly step aside for the city and WRK developers’ $27 million parking garage/condos project called Urban 38. The city and developers at WRK intend to tear down these businesses to make way for their parking garage and condos at 13th and Q streets. The city has already torn down the Taste of China, Wasabi, StarShip 9 and vacant Plaza 4 theaters for a previous project that never got off the ground. I’m all for progress and cool stores downtown — which I hope WRK can deliver — but if you knock out four businesses in historic buildings, you’d better be able to replace them with at least that many, in a better-looking building. It’s not quite as disturbing to me when a national chain is displaced, but still, this is a vibrant little pocket of downtown Lincoln in charming old buildings that will soon be erased. One of the most impressive things about Fort Collins’ downtown is that all those stores are in old buildings. Lincoln’s historical society seems to be largely asleep at the wheel when it comes to these things, however. In North Dakota, the historical society was so active we called it the Hysterical Society. In Lincoln, I’ve yet to see them come down to city hall to fight anything. At least publicly. If Lincoln continues to let old buildings and independent businesses get razed by the city, its downtown will be even less historic, less unique and less alive.